Business Attitude: Local: Competing with the Internet Print Giant in the Evolving Local Print Market and How I Plan to Disrupt (Fix) it. Local: Competing with the Internet Print Giant in the Evolving Local Print Market and How I Plan to Disrupt (Fix) it. This is about much more than the local printer - it's about "Local" everything. It's also about the impressions (mis-information) that Madison Avenue style advertisers can create. The printing business is so typical of "Local"; maybe that is because I know it that way; maybe it is because it used to be so "Local". I have described in past writings what consumers want: it's "NetBetter". As a primer to this, one should read my "Understanding the Changing Print Market" article. This is a long one - I hope you have time. "We don't produce at that low a quality level". 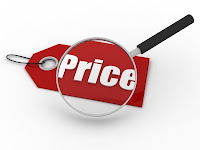 "Here is our price, see if they can match it" (I like this one best). "Here, lets sit down and try ordering some cards from Vistaprint; I'll match their price for comparable product" (when/if they do this you have won a customer forever). Next time you see them ask, "Hey, how much did you end up paying for those $3.99 cards?" When someone hands you a Vistaprint card, acknowledge such and show them the differences. It will point out the importance of first impression and embarrass them in a similar fashion to them ripping their pants all without you looking like a jerk; after all you are only trying to help. Any salesperson (someone who handles many cards) can "feel" a Vistaprint printed card - and that is never a good thing. Let's provide some food for thought here. This will include some research, opinions and some of my solutions. Happy Reading. So today I thought I would do a little market research and evaluate some of the pricing of Vistaprint - every local printer's primary nemesis. So I went in to the Free Business Cards area to get the numbers I have heard people spout. Free business cards were for the quantity of 250; 500 are $9.99 and 1000 are $19.99; all these are amazing prices - if this is what they actually cost. I selected 1000 cards for comparison. I have never had the luxury of having a customer say "get them to me whenever" so I am going to assume that most people, after going this far in the process, choose the "3 Day" option - after all, they need some cards!!! Then came my choice of card stocks and finishes. Now if you have ever felt Vistaprint Cards you know they are uniquely different. The "Free Matte" stock is very light weight, almost like a heavy paper rather than card stock. There are multiple levels of premium offering including both stock weight and finish. I chose the second most expensive choice, which is on a premium stock with gloss finish. I did not see a more specific description of the stock, but I recall in the past this being a 14pt card stock - a very acceptable card stock. This choice added $18.74 to the price. Then came the card's back. If you want nothing done, it's $2.99. Have them print "what you want" on the back - its $7.49. The free version has a Vistaprint Advertisement on the back - How classy is that - sorry, I just laugh every time I see one of those "get your free cards.....". I chose the $7.49 option. (albeit I wanted 1000 rather than the 250). Price sounds like less an issue when you know the facts. 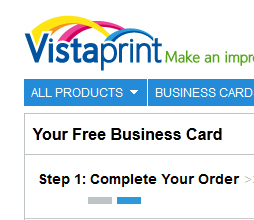 I like so much the way Vistaprint advertises their "Free" and "$9.99" cards that we added a similar (better) product to some of our websites; a "$9.99 for 250" set of business cards. We considered free, but we don't see the demand for the real low quality stuff especially after someone holds one. The Link shows you how we do it - it's not meant to sell you something - after all you are in the business. Get Your $9.99 Business Cards Here. Wow, who has the time to do this? Actually it isn't so bad, especially for the B2C market. I had 15 clicks and each one required some review so it was not like just clicking "next", "next", "next". Vistaprint is the ultimate in "would you like fries with that" website. We can all learn from what they do, even though I do consider, they do it to an extreme. It took me just over a half hour to order my first card. If I had needed to do a second, it would be substantially quicker; probably in the 15 minute range. 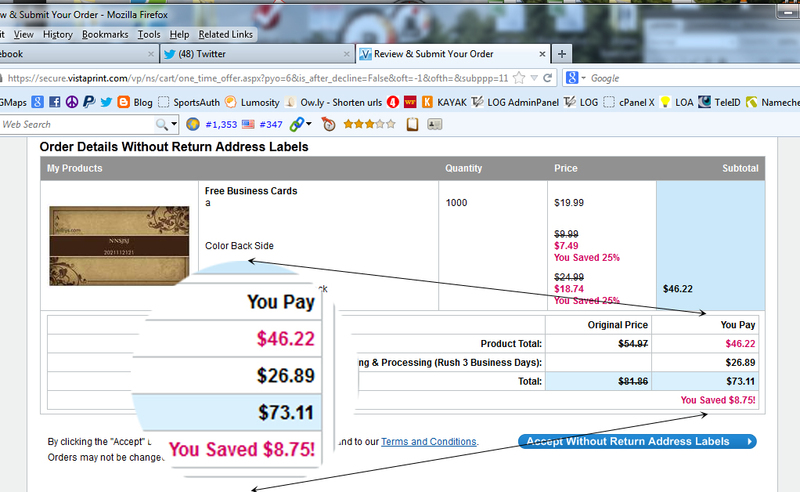 This is why Vistaprint owns the B2C market. In B2B, time is money and this is the first thing felt by the buyer or manager. What if you needed to order a second set (or more)? One could argue that Vistaprint saves the customer design expenses - it's not about you - ever been to a trade show and you get two identical cards from 2 (or more) vendors? How can this happen with so many choices? Popular is Popular. Click. I don't think much needs to be said here. Just feel the difference. 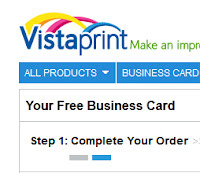 Next time someone hands you a Vistaprint card (I can tell by feel), simply say, "oh, you get your cards from Vistaprint?" Listen to what they say - it's usually funny - it's always a sales opportunity. The Vistaprint card is on top.The correctly sized card (2 x 3 1/2) is beneath. Note the difference in size. Local will win only if the "Locals" can work together. Their growth must be about taking back the local and not fighting over someone else's local. 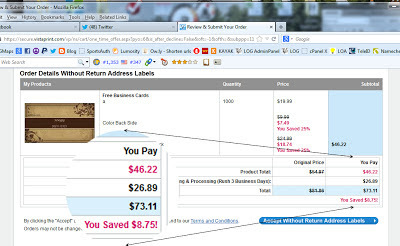 Get back the Vistaprint customer - educate the Vistaprint customer. There are many branded websites out there (Their site, your name), but they are each unique; like many many small fish fighting for the same food. There is a need to learn from Brick-and-Mortar examples. Bill's Hardware can't compete with the marketing and buying power of Home Depot; but it can under an Ace or True Value Logo. Want more info? See the articles from May 2012 "Why Branded Websites Don't Work With Any Business, Especially with Local Printing", from April 2012 "Who Me, “Who Three” - Fixing the Local Print Business – Part Three"; and, also from April 2012 "Understanding the Changing Print Market". Our solution at LightsOn is to provide a uniform online collaborative brand; much like Ace Hardware or True Value Hardware does for the local Brick-and-Mortar hardware store. When you visit LightsOnGraphics.com note The local info (Your local info) on the right. Our objective is to fill that with people in that local's graphics business. Our plan is never to take your local business, we don't want the business from the phone call that the website generates, we simply want the business from the website - the order you would have lost anyway - with the local referrer/printer/designer getting an attractive commission. Our Objective is to recreate the "Local" printer the way ACE Hardware recreated the Hometown hardware store. How will we do this? Read more. Who Me, “Who Three” - Fixing the Local Print Business – Part Three. Want more now? Local Printers, Local Designers, Local Postal Stores - collaborate with us, collaborate with each other and Brand Local - turn the LightsOn in your home town. Call or email for more information.